Lang Suan Road, where I live, deserted. This streets runs to Lumpini Park, red shirt barricades at both ends. Everyone is inside, waiting for the military to arrive. government offensive to regain control of the protest site, this is to push the protesters back to where they were when the fighting began last Thursday. I live less than one kilometer from the center of the protest site, until Sunday night the fighting was moving away from me and not toward the heart of the protest itself. 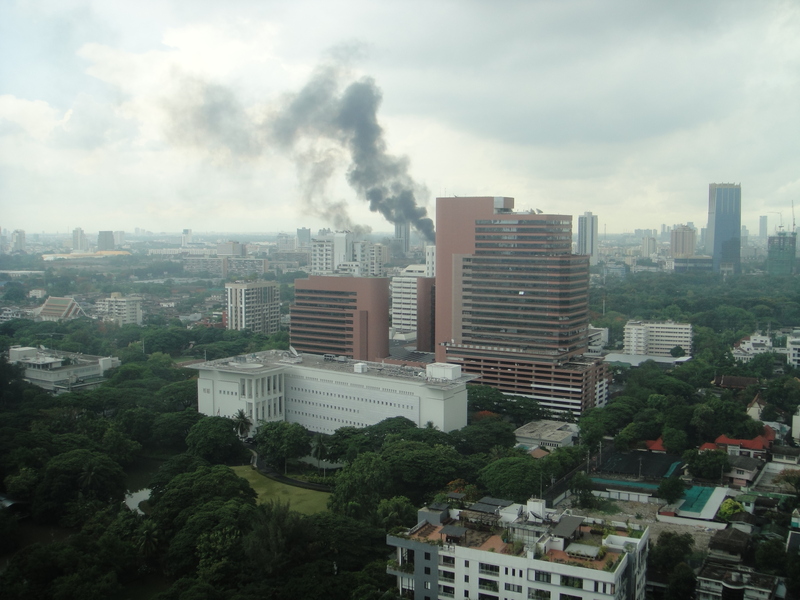 The people of Bangkok are not involved in the fighting, the fighting is the military against some of the red shirts and groups that have associated themselves with the red shirts. The groups associated with the red shirts are the danger, some are the black clad guards that are ex-military, are heavily armed and trained, are skilled fighters are attacking the military. There are also simply troublemakers and antichrists; this is the group that scares me the most. They are riding around on motorbikes with a gang mentality- they are not from Bangkok and have a “let’s destroy, hurt and steal” mindset. Last night 4 motorbikes rode up and down the street I live on with no lights on- after 2 laps of the street they used small bombs to blow the windows out of two 7-11’s and two restaurants. I went to look this morning, they didn’t steal food, just tried to steal money. The government does not have any aspect of the situation under control. This is a war, not a battle. There are 4 major battle grounds in Bangkok, the military does not have the decisive numbers to claim a victory in any of the battles. Residents of the neighborhoods have not been able to leave their homes for days, they need food, water and the chance for evacuation. The shock is that this is happening. We (Westerners) are all raised and taught that logic will prevail. I continue to expect that someone will say “this is f*$#*@%g crazy, what are we doing?” and work to end the situation; this is not happening. 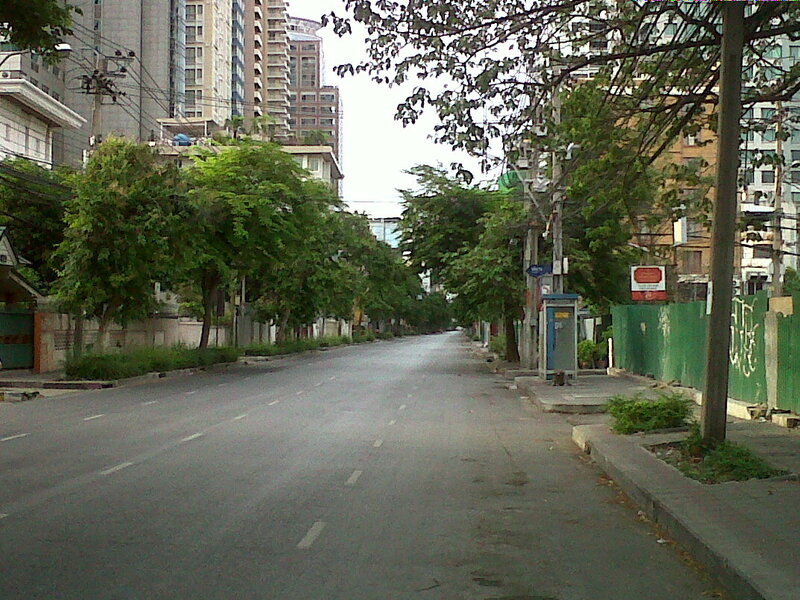 People are dying, innocent people walking down the street are being shot, Bangkok is closed on Monday and Tuesday. What is needed to make this stop? There are major problems with what has been happening- beginning with the obvious fact that you have massive fighting in Bangkok- including: Thai military fighting Thai people, the military isn’t fully committed to this fight; the red shirts have been fortifying their positions for 30 days and are well prepared; the inherent anarchy of urban fighting in a place with tall buildings and very small side streets. I have tremendous empathy for all USA troops that have been a part of the urban warfare around the world. As the fighting drew near last night, my heart was in my ears. The flash of a grenade, the hiss of an M-79 being launched and the sound of automatic weapon fire is unlike anything I have heard and left my brain in a state of near panic. I don’t know how you train someone to fight a war, if I was fighting I would be shooting at anything that moved, sheer panic shooting. And that is what is happening here- on both sides. The military shoots at anything that moves, the red shirts bomb and weave, continue moving and keeping the military guessing. Likely scenarios for Monday- heavy fighting with military offensive to push red shirts back and even attempt to capture the protest site. Time is running out for the PM and military- the PM must show he is in control and the longer the military lets the situation go the more dangerous it becomes as the red shirts break into splinter groups and additional red shirts arrive in Bangkok. I cannot believe it, but things will somehow get worse before they improve. My situation- have food and water for 5 days; cell phone/internet access is off and on; building is safe and secure (have INTL reporters staying here); better to say here than be out and about in BKK. This entry was posted in Bangkok, Culture, Politics, Sightseeing, Thailand and tagged Bangkok, Bangkok protest, is bangkok safe, Red Shirt March, Red Shirt Protest, red shirts, Red Shirts in Bangkok, Red Shirts Protest, travel to Bangkok now. Bookmark the permalink.